Boat Ride Thrills Captured On A Post Card. Ya know that boat ride you took when you were a kid, and you never had a souvenir to show for it. Here is your chance thanks to eBay. You can relive the thrill of being crammed into a boat with 7 other folks, no life jackets, some fat guy farting and some idiot lighting up a smoke.. All for the joy of going 20 knots.. if you are lucky. And to be honest, if I could I would have loved to have had the chance… of course I would be the fat guy farting! Click here for the auction..
More Last Gasp Photo's Coming In From All Over The Country. They Woody Boat Differently In Idaho! Does the back of the card state that it was shortly after this picture that the CG started doing safety checks? Come on aboard, we still have another couple of inches of freeboard! And the weather never changes! 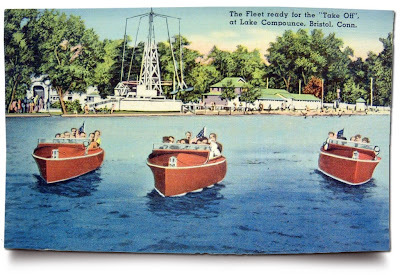 Does the back of the card state that in fifty years you will be spending 120K restoring a boat so you can relive the experience you had as a kid? That’s what gives you the gas!